To the jazz cognoscenti, Miles Davis’s peak playing years were when he was playing with Charlie Parker right up to when he made the series of recordings collated under the title “Birth of the Cool”. In those days, he was known only to the true jazz lovers. It was only when his chops packed up and he spent most of his time blowing basically a load of meaningless nonsense that he became popular with the masses. He did it by surrounding himself with some great players like Coltrane and Herbie Hancock, and Keith Jarrett etc.. But he also added a thunderous rhythm section giving his group a pop music sound. I remember going to see Miles and his group here in London with famous comedian Bill Oddie. Bill loved it – as did the ecstatic audience. To me, it sounded more like Dunkirk with a rhythm section! Miles would come to the front mike and blow three or four high D’s followed by a couple of meaningful arpeggios and then go back to wandering around the stage as if he was looking for something. If it was inspiration he was looking for, he never found it! Keith Jarret, when you could hear him through bombs being dropped in this rhythmic air raid, was by far the most creative player. A couple of years later, I founded London’s only jazz radio station, Jazz FM. Apart from running the station, I had to cover other areas of jazz, such as: judging young jazz musician’s competitions, or lecturing about the who and the why of jazz to 14 and 15 year old kids in schools up and down the country. Somewhere near the end of March 1990 I got a letter from a big time jazz association, whose several thousand members had voted for Miles Davis as the jazz musician who had done more than anyone in the cause of promoting of jazz. I was asked if I would collect the award on Miles’s behalf, who was back in the States and in poor health. This society had gone to tremendous trouble to come up with a suitable present for the great man. After months of research and several conversations with those close to Miles, they had gone to the very exclusive Getzen company in Wisconsin, who make only the finest hand crafted trumpets, and who on the strict instructions from, I believe, Red Rodney, a wonderful trumpet man and an ex-Charlie Parker sideman who knew Miles very well, had made a bespoke trumpet of the very highest quality, together with a special mouthpiece that would make Miles Davis a very happy man. 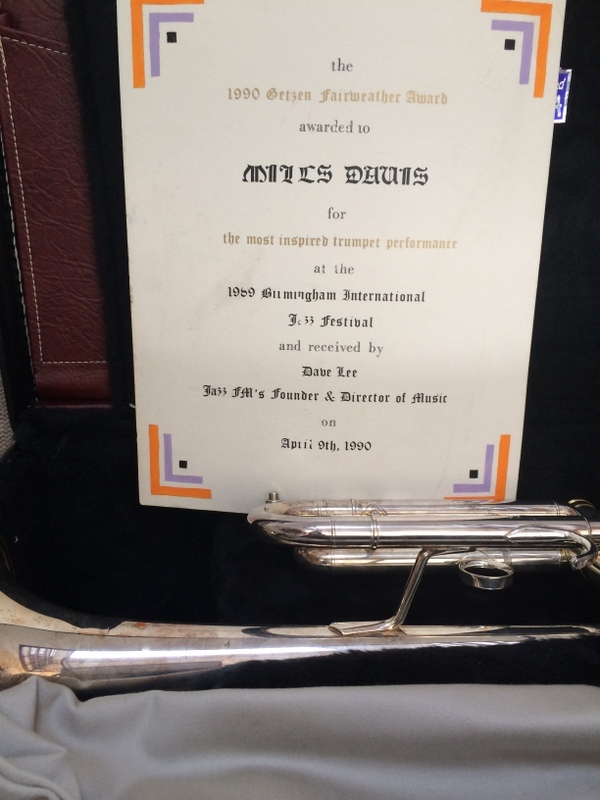 Inside the very expensive leather trumpet case was a pouch containing an ornate certificate saying ‘Awarded to Miles Davis and received by Dave Lee, Jazz FM’s Founder and Director of Music’. I agreed to accept the trumpet and was sent a first class railway return to Birmingham (in England, not Alabama), and after a magnificent lunch I made a speech to the several hundred members present. My speech contained at least as many corny clichés as the smarmiest politician. Then I gave a brief history of his work. (I did not say that Dizzy Gillespie was extremely unimpressed with his playing, telling me that he could name ten trumpet men all of whom who would blow him out of the room). The gig was to eulogise, so I eulogised and that was it. Now it was my task get the horn over to Miles in the States. Once back in my office I phoned George Wien in New York City. He was a very important guy who promoted the famous Newport Jazz Festival. He gave me Miles’s home telephone number. “Yeah?” I immediately recognised Miles’s gruff, hoarse voice. “Miles” I said. “My name is Dave Lee, the founder of Jazz FM radio here in London……… “and I went on explaining to him about the award, finally asking him for an address to send the trumpet. I was going to ask “Does that include the mouthpiece as well?” But he had slammed down telephone before I could say another word.